Nippon Paint (India) Private Limited – decorative division, announced the winners of the 2018 AYDA Awards (India) edition. The grand finale, held over a course of two days at Le Royal Méridien Hotel, Chennai, had architects Pinkish Shah (S+PS Architects), Krishnarao Jaisim (Jaisim Fountainhead), Jabeen Zacharias (Jabeen Zacharias Architects), Swanzal Kak Kapoor (Saka Architecture), Tanuja Kanvinde (Kanvinde Rai & Chowdhury Architects & Planners) and Mahesh Radhakrishnan (The Madras Office For Architects) as the jury to judge the shortlisted projects, and award the winners. Established in 2008 Asia Young Designer Award (AYDA), a part of Nippon Paint’s vision to nurture the next generation of design talents across Asia, is touted as one of Asia’s premier design award across 15 countries including Japan, Malaysia, Pakistan, Iran, Indonesia, Philippines, Singapore, Sri Lanka, Thailand and Vietnam. “Over the years Nippon Paint’s AYDA has established a close-knit design community of professional architects, interior designers, industry associations, leading design schools and most importantly, talented design students. 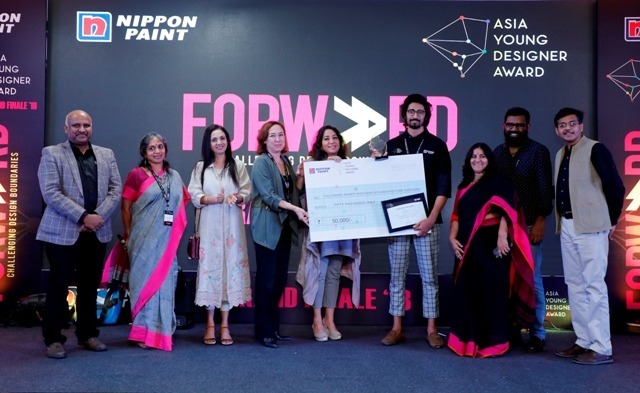 We are overwhelmed by the sheer amount of entries this year and are certain that the event will serve as a great platform to inspire talented architecture and interior design students to develop their skills through cross-learning opportunities and networking with key industry players,” said S Mahesh Anand, president – Decorative Paint, Nippon Paint India, on the sidelines of the finale. Over 1300 architecture and interior design students across India participated in the current edition of the contest. Out of the 23 shortlisted candidates, four students emerged as winners. A winner from each category (Architecture and Interior Design) was awarded the gold and silver award and cash prizes of Rs 50,000 and Rs 25,000 respectively. Tanay Bothara – VIT’s PVP College of architecture, Pune won the gold in the architecture category, while Bhavya – Pearl Academy, New Delhi was awarded gold in the interior design category. The gold winners will further receive a fully paid trip to compete at Nippon Paint’s Asia Young Designer Summit, to be held at Singapore on March 21st 2019. In fact, all the respective AYDA 2018 gold winners from 15 Asian countries will compete for the coveted Asia Young Designer of the Year Award 2018, Pan-Asia level and also get a lifetime opportunity to attend a six-week Harvard Design Discovery Summer Programme at Harvard University – U.S.A, worth more than $10,000.